The Tour Desk has made arrangements for the following activities which will enable enjoyment of Myanmar culture. The Thiripyitsaya Kitchen has designed a Myanmar menu that Guests can easily prepare and savor. 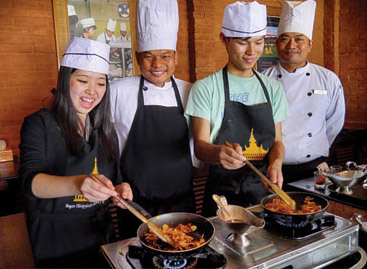 Our Head Chef can conduct cooking lessons for Myanmar cuisine, including soup, salad and curry. 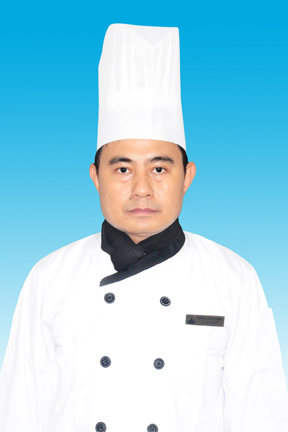 Introduction of our Head Chef, U Nyein Chan Win, has brought our Kitchen to the fine standard it can be proud of. With extensive international experience, he progressively honed his skills working in Yangon and abroad for 21 years. He has come back to Myanmar to bring his discriminating touch to Myanmar cooking, producing dishes that are authentic, but also extremely pleasing to the foreign palate. His cooking classes are not only educational, but enjoyable as well. After choosing the lacquer plate or coaster with a pattern from several flower or traditional Myanmar arabesque designs which craftsmen have engraved, one is taught how to apply color by the scratching method and come up with one's own unique one-of-a-kind lacquer ware in a special workshop.